Ezekiel is one of the most fascinating books of the Old Testament, its unusual language and imagery having puzzled and inspired Jewish and Christian exegetes alike. This study gives you an overview of the book as well as looking at some of its key passages. Designed as a Sunday School curriculum for sixteen or seventeen weeks, this can also be used as a small-group study guide or for personal enrichment. Through this study, Lord willing, you will find yourself deepened in your understanding and appreciation of this unique book and the man who wrote it. The primary difference between the study guide and the workbook is that the workbook contains space to answer the questions, whereas the study guide does not. The workbook also contains a journal in which you can record your observations from your daily readings of Ezekiel. Because if this it has a good deal more pages than the study guide does. There are certain restrictions that apply to the distribution of this study guide. They appear on the copyright page of the respective PDF files. 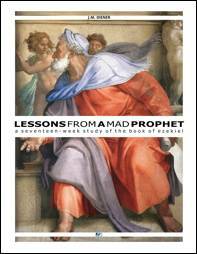 You can also read them at the Lessons From A Mad Prophet Copyright Information page.